Sophie was invited to a birthday party this week, so instead of heading to the store and buying her a gift we decided to make one! We made her a pocket pillow, with hearts on the front (Sophie’s idea). To piece the hearts I used the I Heart You Mini Quilt Pattern I shared a couple of years ago, and I made heart blocks 2 and 3 for the front. Then sewed it into a pocket and sewed a pillow! Stick a book and a treat inside the pocket and it’s one of my favorite gifts for a kid, I use these instructions from my book all the time. You’d think I would have the instructions memorized by now…but no…my brain is apparently full and I can’t remember anything anymore. A month or so ago I hung one of my favorite quilts (Spin Cycle pattern) on my wall. I didn’t want to poke holes in my newly painted walls, so I used command hooks and it worked amazing! I’m ridiculously excited by this. I sewed little tabs out of scraps on the top back edge of the quilt every few inches, then I slid dowels (from Home Depot or any craft store) through the tabs. I measured down from the ceiling to get the four command hooks straight, then stuck those on the wall using the directions, and slid the dowel on the back of the quilt into the hooks to hang it. Worked like a charm, and the quilt is perfectly straight! If it wasn’t straight I would have just raised the dowel a bit at the hook where it needed raising, even just by putting a piece of fabric around the dowel or something easy. I used these Command Hooks, the medium wire ones that have a higher weight capacity. Anyways…totally random thing…but I’m loving how easy it was and no holes in my walls! 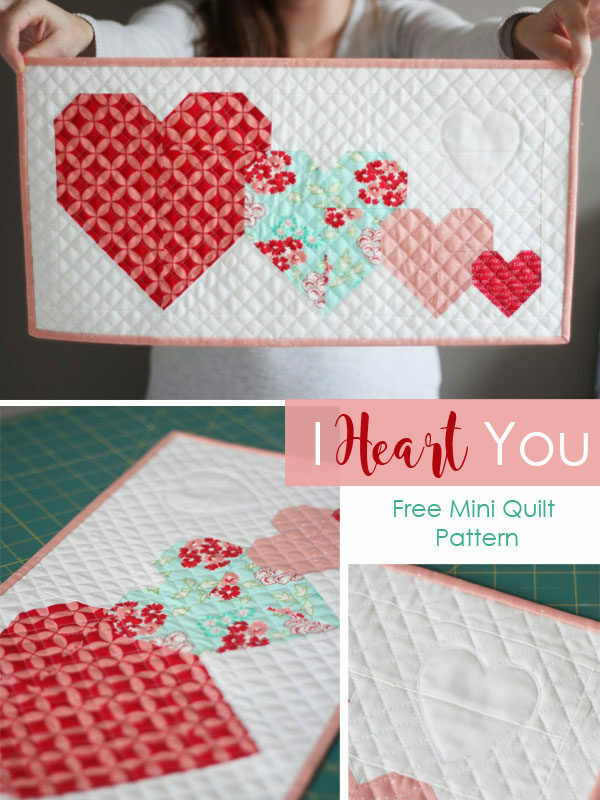 Here is the direct link to the I Heart You Mini Quilt Pattern in case you need a quick sew before Valentines Day! I’m confused. 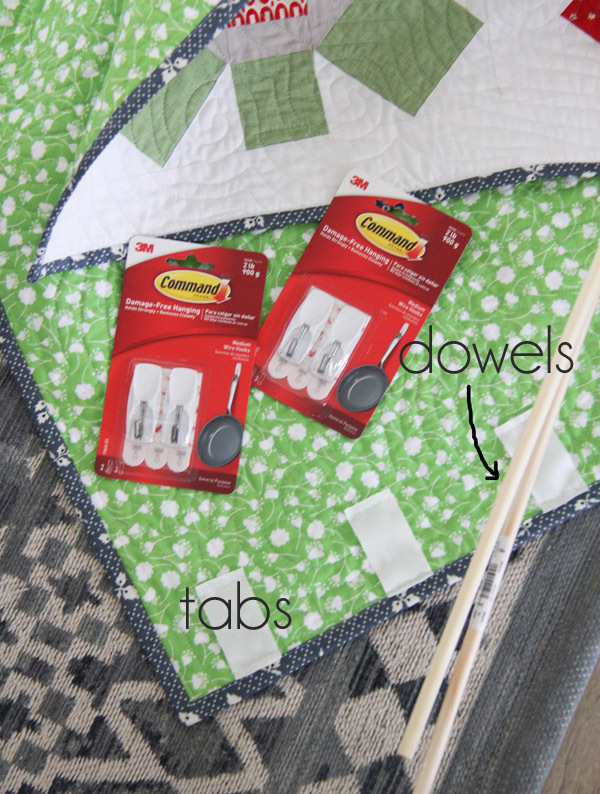 How did you keep the dowels from showing above the quilt since the tabs go up to the binding? Did you test the dowel for size and stitch across the tab to keep it from riding up and showing or are the dowels skinnier than the binding so they don’t show anyway? I stuck the dowels through, then put stitches closer down to make sure the dowels were tight in the tabs, and it keeps them from slipping up. 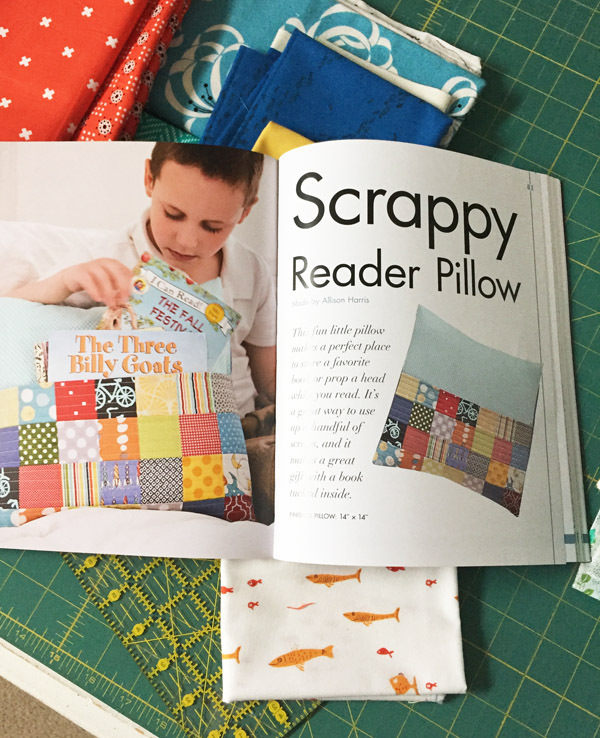 Love the book pillow, what a great idea for a birthday gift! 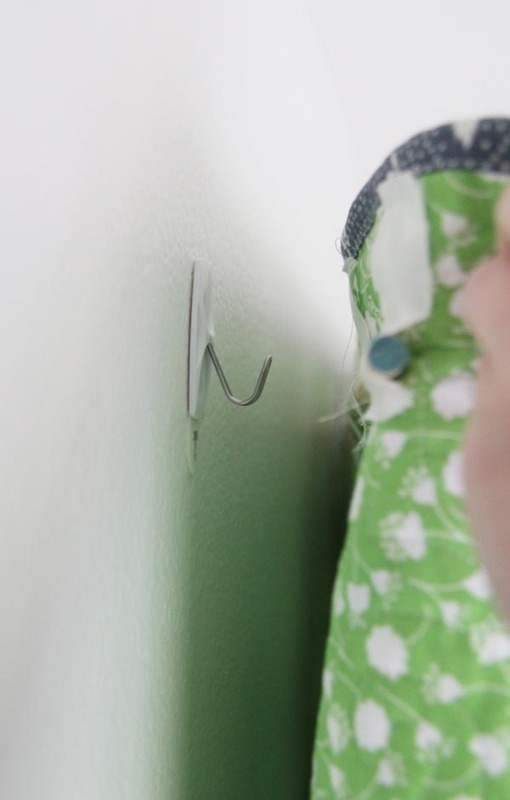 I use command hooks too, and I’ve only used them on mini quilts so I sew a couple of d-rings (I just hand stitch over the two corners a few times) on the back so I don’t need a dowel. It works great! I doubt d-rings could hold up a large quilt but it’s great for minis. I love the tabs you sewed on for the dowel, so much better than the triangles in the corners. Wow this is all so great! 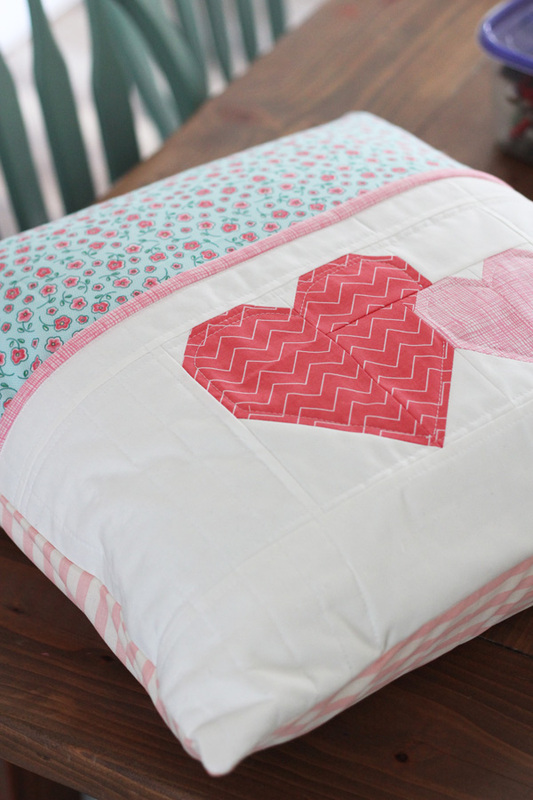 You could make that pillow for any age and add gift cards for teens! I’d love it as a gift for myself lol! Def, going to be making all of this this week. Thank you for the great post and instructions! I love your pocket pillow pattern. I’ve made several for gifts and they are always loved! I’ve also made several of the quilts from this book, it’s an awesome resource, thank you for the creative ideas. What a great idea for a kid’s birthday present. INGENIOUS. I can even see it as a little gift for someone recuperating from an illness, needing to stay in bed, or to bring to someone in the hospital. I’m gonna make a bunch of these pocket pillows to keep on hand for just such occasions. Thank you so, so much doe this. I also use command hooks all around the house. The neatest thing about them is that they can be removed without a trace should you change your mind about where you want to hang anything at all. Not reusable though, so keep a bunch on hand in different sizes. I live in an apartment and the command hooks work for me also. I have mine up for over a year and still hanging strong. I used a larger rod with ball ends and I also used the larger command hook that you can see. I use command hooks where ever I can instead of nails. I also use them on my windows during the holidays to hang things for decoration. 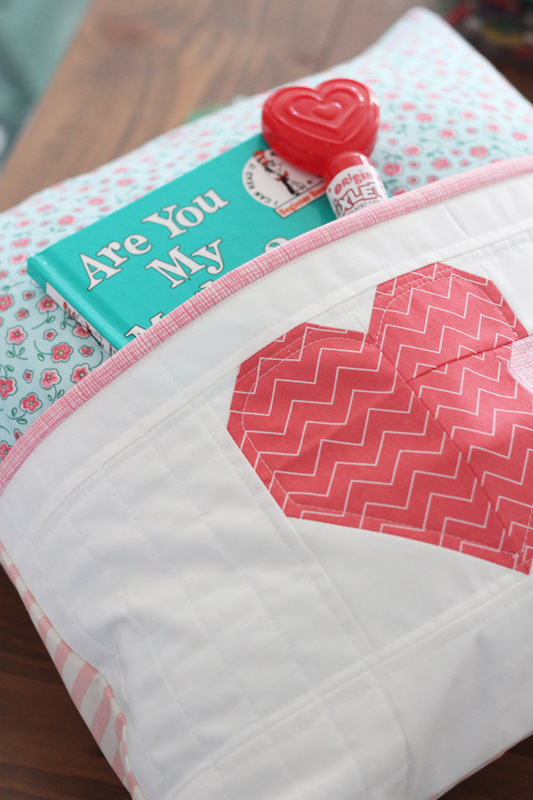 I really like the pillow pocket with the books tucked inside as gifts! Plus, the way in which you hung your quilt in order not to have to create holes in the walls is an excellent alternative. Thank you for sharing both of these superb ideas with us. Have a great day! I love the fish fabric! Is it your design? And where can I get it? Would make a great backing or large sized quilt square. That is an older Heather Ross print, I think the line was Mendocino! I use these hooks all the time. I make seasonal wall hangings and use these hooks to hang them up on my apartment door. Gives my neighbors something nice to look at. Never had one swiped yet (I must have good neighbors). Nice gift for a reader. We’ve had a few last minute party invitations, and I’ve whipped up an appliqued bag and filled it with coloring or other art supply objects. I’ve been wanting to hang a quilt on our big family room wall, and now I’m sold! I suspect my kids would think it was a waste of perfectly good tent material, haha! Love the quilt. I have tried command hooks but have never been able to remove the without pulling the paint off the wall. I can’t seem to get their removal directions to work for me. I’m always worried that will happen…but luckily I’ve never had a problem. I just took some off I’d had on for four years…and all 16 of them came off and didn’t leave any marks! I wonder if it has something to do with the type of paint? The pillow is a great gift. Love your quilt hanging idea too. Great gifts idea! I guess I will make a pillow for myself soon. 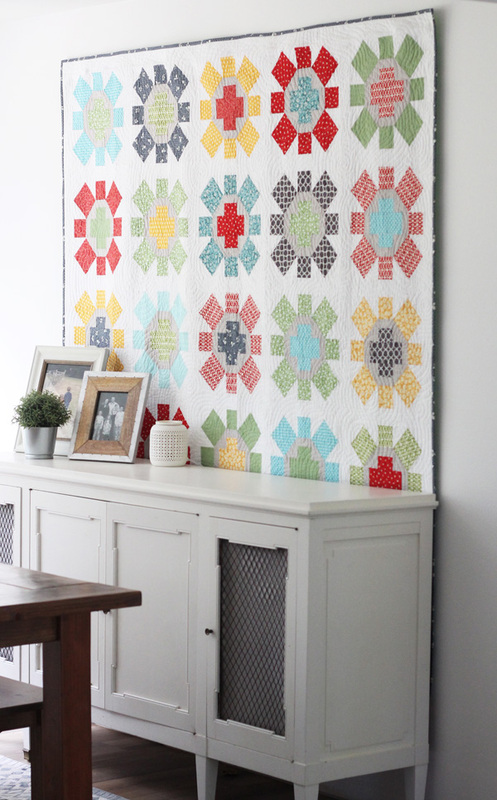 That wall hanging quilt is also stunning! Love it!